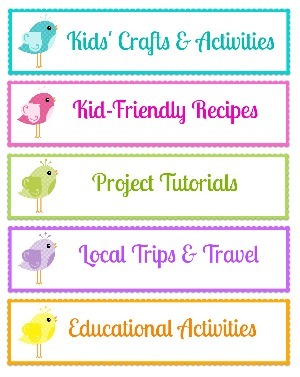 We just started our Spring Break and the kids are already itching for something to do. 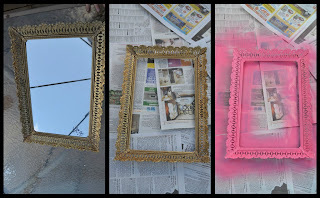 Today's activity was fun and super inexpensive (I'm talking $1!!). While my son played downstairs, the girls and I created this fun Spring mural on a shower curtain. We had a good time painting it and now our bathroom has been spruced up with a touch of Spring. I just spread out an old sheet on the floor, spread out the shower curtain liner, and we got to work. 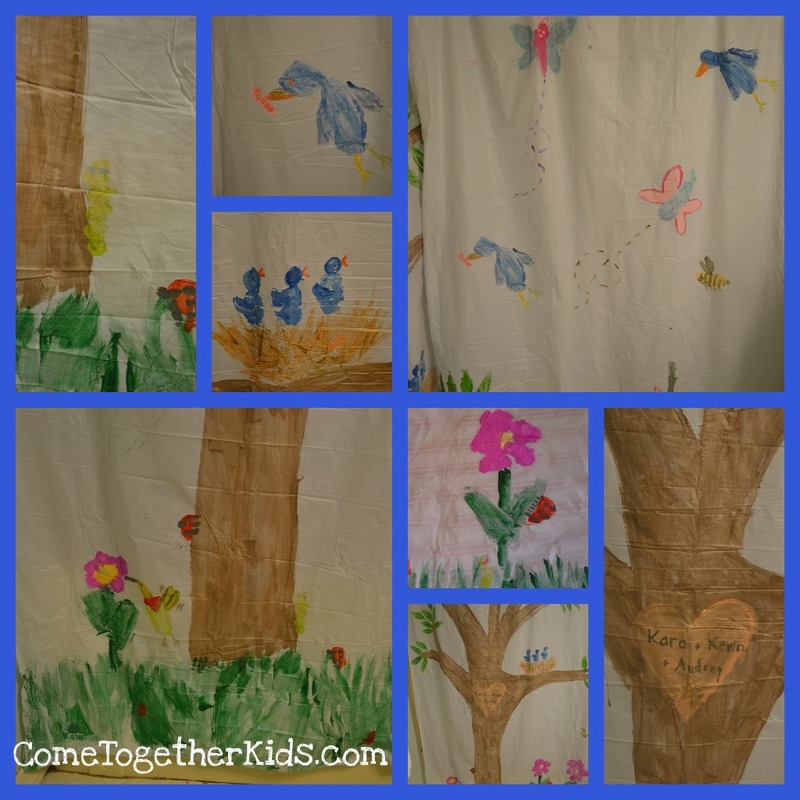 We used a bunch of acrylic paints I had on hand and painted on a whole Spring scene ~ a tree, birds, butterflies, bumblebees, flowers, caterpillars and even a hummingbird! To personalize our mural, I painted on a "carved" heart with the kids' names on it. Here's a few "close-ups" of the details. Isn't it cheery? 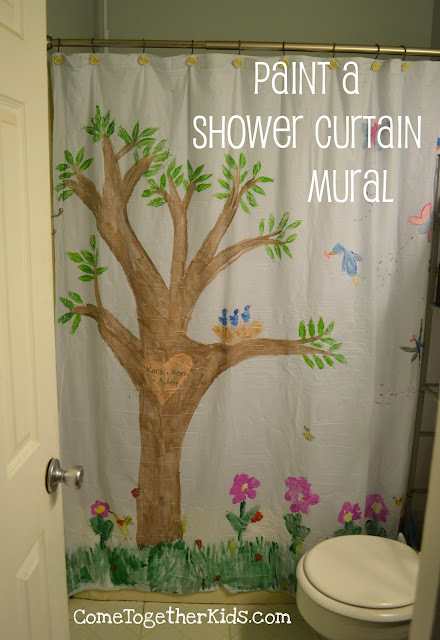 It really brightens up our bathroom and the kids love it (and I do too!). Every time my youngest daughter comes out of the bathroom she says, "That just makes me happy". At just $1, I know we'll be making more for each season and for different themes. Let's face it, parenting can be tough. Every day we face any number of challenges and we don't always have easy solutions. I may not have the answers for the really big issues, but I have collected several great tips for many of those little annoyances that can be just as challenging when you deal with them day after day. The best part? Most of these tips are simple, easy, why-didn't-I-think-of-that solutions to common problems you'll come across during your crafts, projects and day-to-day life. 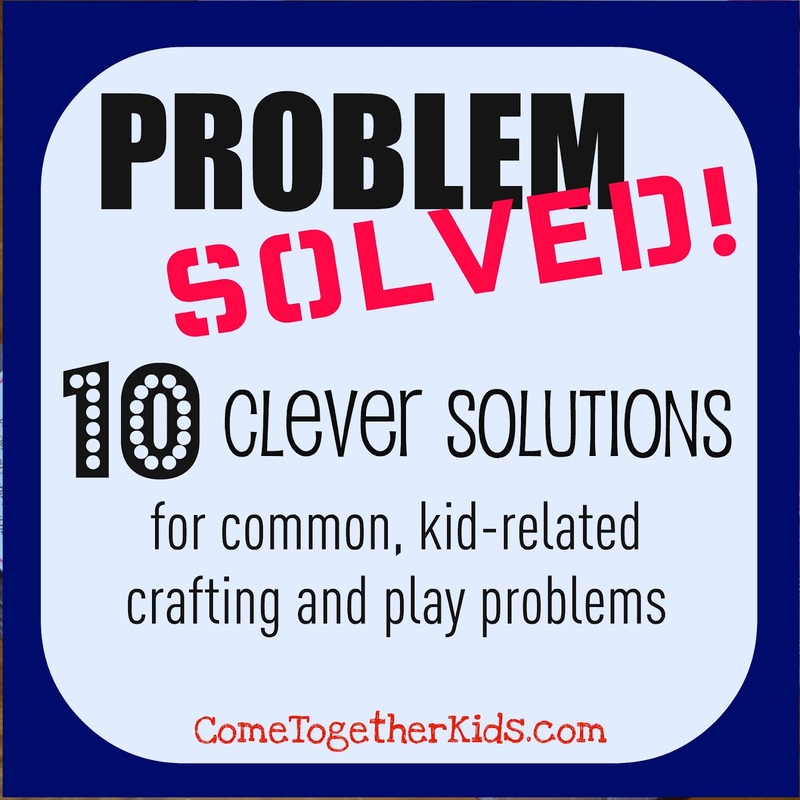 Many thanks to several awesome kid-centered bloggers for their input and great advice. The Problem: It's a nice day, the kids are outside blowing bubbles, but within minutes, someone's bottle of "bubble juice" spills. Now a kid is crying, you're trying to refill it and spilling more than you're getting into the bottle. Pretty soon, the fun day of bubbles is full of tears and spills. 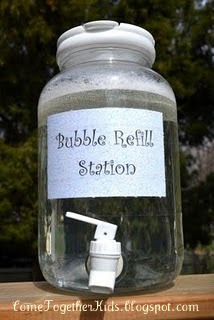 The Solution: Get an inexpensive plastic container with a faucet and re-filling bubble containers is a breeze. Plus, you can make your own bubble solution and save a few bucks too! The Problem: After a fun afternoon of crafting, there's glitter everywhere. 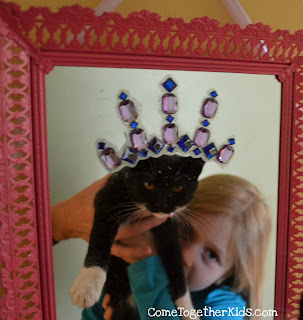 The Solution: Two awesome moms gave this solution ~ use playdoh to clean up the sparkles! Just press the playdoh onto the glitter and it'll pick it right up. Now your craft space is sparkle free and you have some fun glitter playdoh to play with! 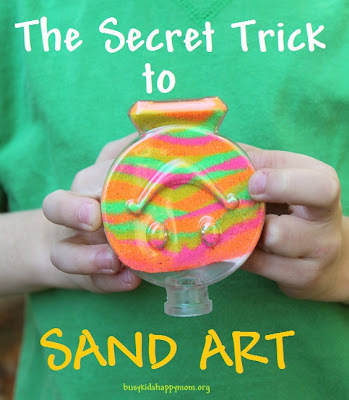 The Problem: Your kids have just worked hard carefully layering colored sand into a Sand Art masterpiece and put the lid on. Unfortunately, within minutes, the jar has been jostled and all those pretty layers turn into a muddled mess. The Solution: I'm not going to give away the secret, but here's a hint... all you need is some glue to keep the layers in place. 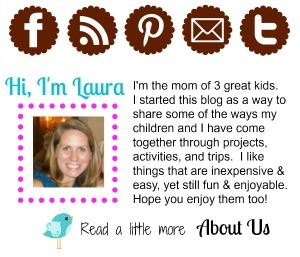 Check out Kristen's great tip at Busy Kids = Happy Mom! 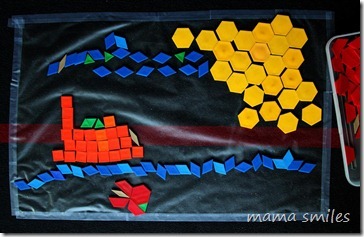 The Problem: Your little ones are hard at work using pattern blocks and making fun pictures and shapes. Then someone bumps the table, all the pieces shift and the beautiful design is all messed up. 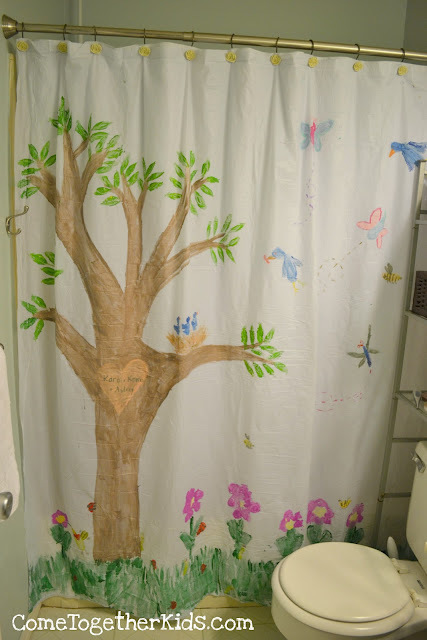 The Solution: Take a look at the sticky trick MaryAnne came up with HERE at MamaSmiles to solve the problem. Now the pieces stay in place and the kids can make elaborate pattern block creations without worrying about shifting tiles. The Solution: Check out this clever solution Cari shows us at Time for Play. All you need is a container of water and your work is done for you. The Problem: Your children like to show off their independence at breakfast and pour their own syrup. (or salad dressing at lunch, or Parmesan cheese at dinner, etc.) Unfortunately portion control has not yet been mastered and their food is soon swimming in syrup or other condiments. 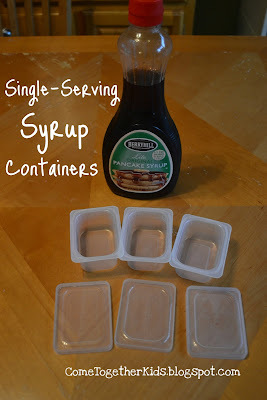 The Solution: Take a few minutes to pour single serving sizes in individual containers. (We used the plastic baby food containers) Then set out their plate and let them pour away to their hearts content. BONUS food-related tip suggested by several clever bloggers... Use kitchen shears to cut your young children's food. Works great on chicken nuggets, fruits, veggies, pizza, etc and it's way quicker than a knife and fork. The Problem: Your preschooler keeps trying to string beads, only to have a tough time managing holding the string and getting the beads on. The Solution: Deborah at Teach Preschool. offers this tip... tape one end of the string to the table! Now your little one only has to hold one end of the string and they have their other hand free to pick up beads and string them on. The Problem: Your kids leave the lids off their markers and they've dried out. "When markers start to dry out, dip the tips into white vinegar and set so that the tips are standing up. Wait about 5 minutes, then blot the marker tip on some paper until the color starts to show. Place the cap back on, and let sit overnight"
Another tip is from Trisha at Inspiration Laboratories. 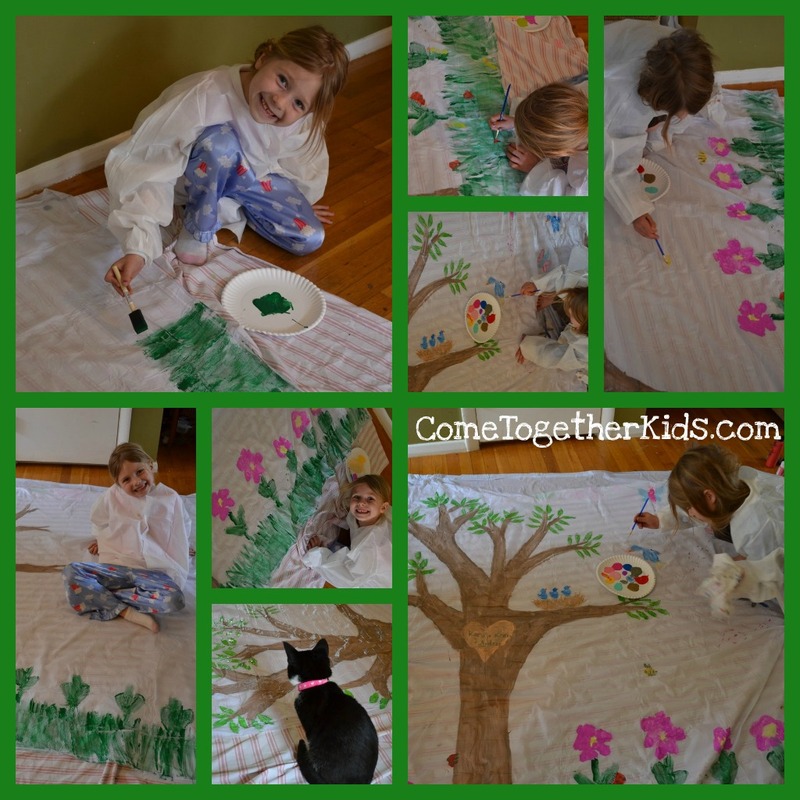 "When markers start to dry out, you can also dip the tips in water and paint with them. It will have a watercolor effect"
The Problem: Your kids stuck some crayons in their pockets and now they've gone through the washer and dryer! The Problem: Your child has a special day,trip or event coming up and you are constantly bombarded with "How many more days until..." questions. 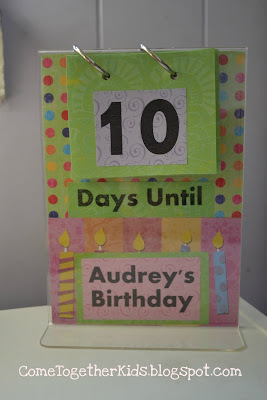 The Solution: Make this cute little stand they can use to countdown to the big day. Look at this pretty Tiny Twig Necklace that Heather said was her favorite. So pretty! Heather, I'll be emailing you tonight to let you know that you won, and I'll pass along your info to Lisa. Thanks to everyone who participated and a special thanks to Lisa for this opportunity. When I first saw the trailer for the new Mirror Mirror movie, I knew a trip to the theater would be part of our Spring Break plans. Snow White was one of the first movies I saw in the theater myself as a little girl (when it was re-released in the 70's, not the original in 1937!) and I knew my own kids would love seeing a "real-life" version of one of their favorite animated movies. The movie comes out on March 30th and it's rated PG, so it'll be perfect for my family. Then, shortly after I saw the trailer, I was contacted by the makers of the movie to come up with a craft or project inspired by the Snow White story. Seriously, how cool is that? One of my projects connected to a major motion picture? It's the closest I'll ever come to being a movie star!! And you have to check out the Mirror, Mirror website. You can watch the trailer for the movie and your kids can play in Snow White's virtual dressing room, choosing their own outfits and hairstyles for the princess. Oh, and check out the Social Queen tab on the website ~ it's a clever little clip showing the Queen using all sorts of social media! Of course, you can follow and "like" Mirror, Mirror on Facebook yourself and even see what they have on Pinterest! First, we have this lovely maiden. but is she the fairest in the land? 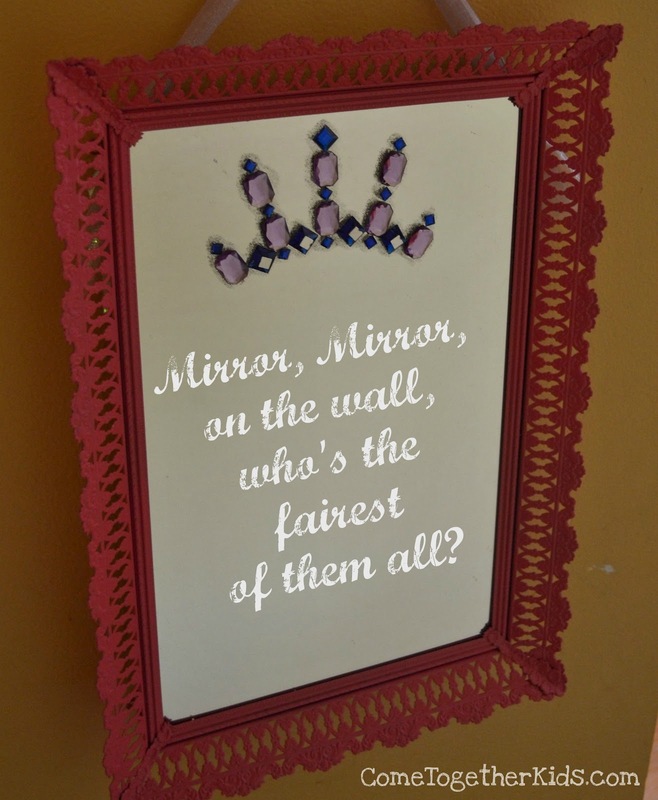 Indeed, she is the fairest in the land! lovely maidens in the castle. will even work on the royal kitten. but you'll just have to take my word on that one! 1. 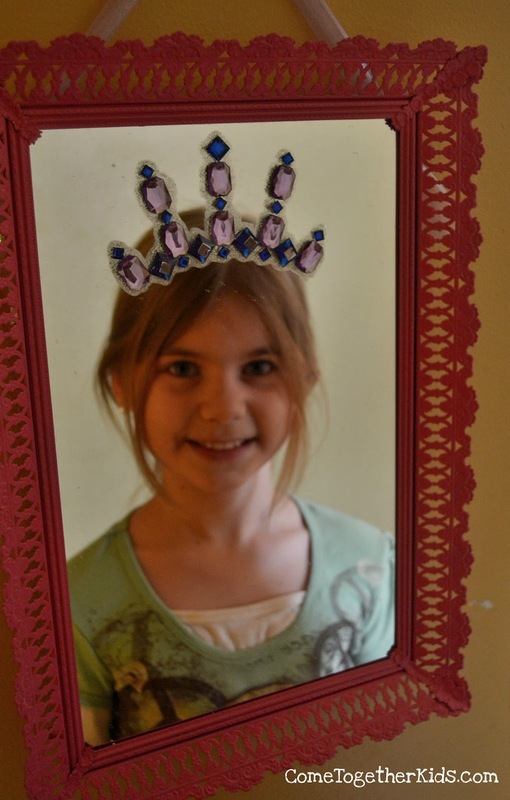 Find a mirror that's big enough to include a life-size crown. I lucked out and found this mirror at Goodwill for just $8. 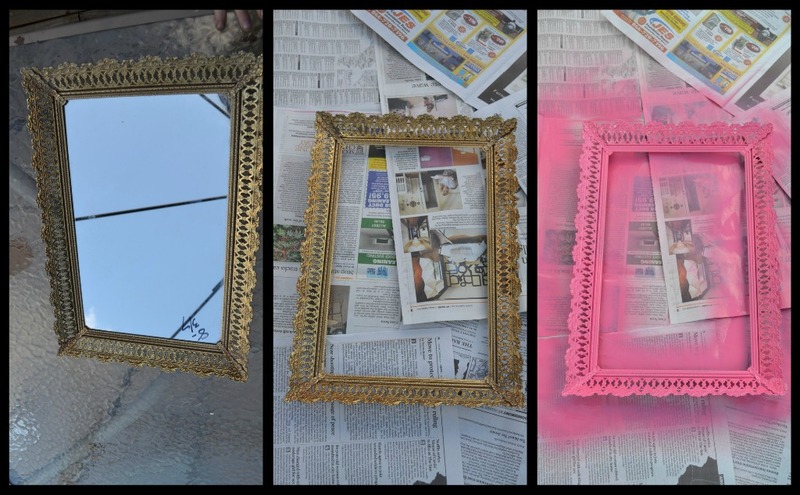 With a little bit of pink spray paint, it was perfect! 3. 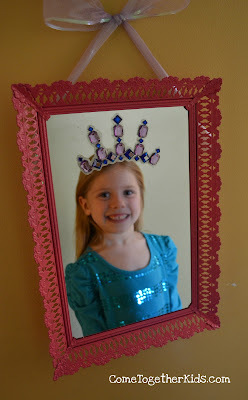 Have your child stand a normal distance away from the mirror, and use the glitter glue to draw the size and position of the bottom of your crown so it will "fit" on their head when they look in the mirror. It's a little tricky to see, but notice the curved line? 5. Next, I just outlined around the gems with the glitter glue to add a little more sparkle and substance to our crown. 6. Finally, tie a bow with some sparkly ribbon (mine was also from the Dollar store) and attach it to the back of your mirror so you can hang it up. 7. That's it! 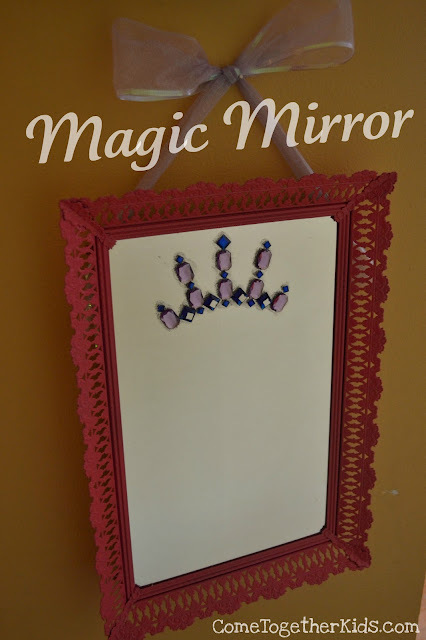 Hang up your mirror and enjoy a little magic each time you catch your reflection and see the princess within! So how about you? Will you be seeing the Mirror Mirror movie with your family when it comes out on March 30th? How would you like a cool prize pack to go along with it? Open to U.S. Residents only. Ends April 4, 2012. For additional entries, share this post. (You'll see share buttons on the tab on the right side of this post and a Pinterest button right below the post). Leave a comment telling me where you shared it, Facebook, Twitter, etc. One comment for each share. Finally, make sure you check out these other fantastic projects inspired by Snow White and Mirror, Mirror that are being shared this week! 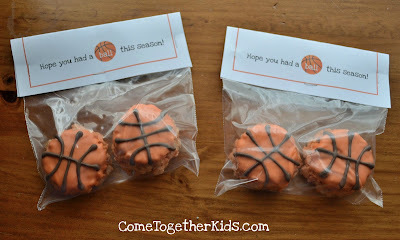 Last Spring, when my son played Little League Baseball, I made these cute Baseball Treats for his team. 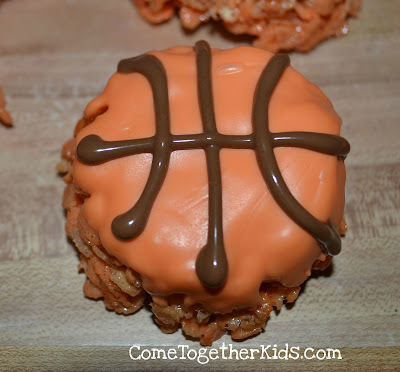 This Spring, he played basketball for the first time and I wanted to make a similar treat for his last game this weekend. They were really fairly simple to make and they were a big hit with the kids. They'd also be fun for a March Madness party or any sports-themed event. 2. Remove from heat, then stir in your 8 cups of cereal. 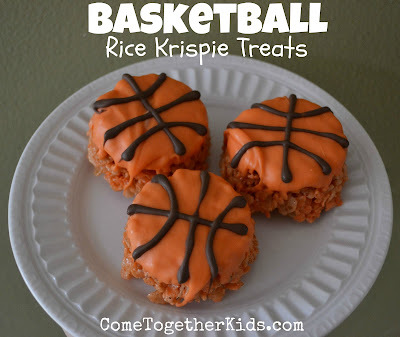 Stir until the cereal is coated with your marshmallow mixture, then spoon into greased muffin tins. Use a piece of waxed paper coated with cooking spray to push the mixture into the muffin tins. 3. Allow the treats to cool in the tins as you melt your orange melting chocolate. (I have this Chocolate Melting Pot that I love for this kind of treats. It keeps the melted chocolate at the right consistency so I can dip a whole bunch of treats without reheating.) Dip one side of your Krispie Treats in the melted orange chocolate (I dipped the smoother side that was pressed against the bottom of the tin). If you're just serving the treats on a tray at a party, I'm sure you could just use regular frosting instead of the chocolate. However, the chocolate lines are great if you're packaging the treats up because they won't smear. Excuse the crappy picture, it was late at night and I didn't see how blurry it was. 5. 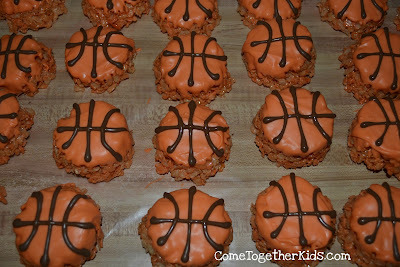 Next, just squeeze on your lines on the basketballs. I simply made a cross, then two curved lines on either side. 6. 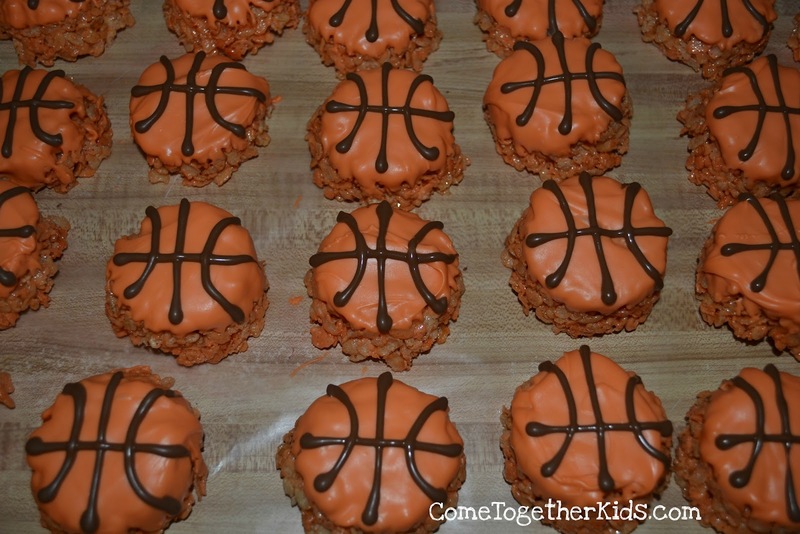 It went super quick with that squeeze bottle and I cranked out 24 cute basketballs in no time. 7. 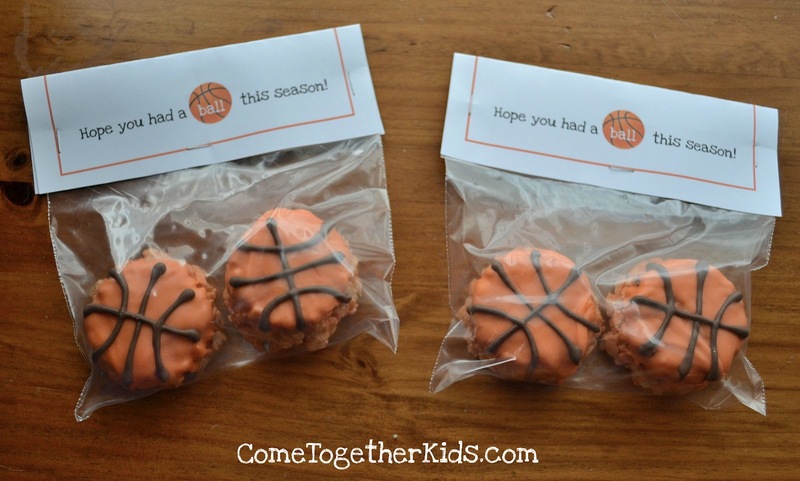 I made up a simple little bag topper (printable here), then packaged up two basketball treats in a sandwich bag for each teammate. Funny little story: When I showed the bags to my son, he didn't understand it at first. I had to explain that "had a ball" is an expression meaning "had a good time". As he was passing out the treats, he explained the expression to each kid to make sure they understood. We're now on week two of some unseasonably warm weather on the East Coast. Often here in Maryland, the first day of Spring is chilly, cloudy and damp. This year, however, the temperatures have been in the 70's and the sun has been shining almost every day. Not only has this perfect weather quickly pushed aside my normal late-winter blues, but It's also got me thinking about Spring planting several weeks earlier than usual. You see, every year around Mother's Day, the kids and I usually go to a nearby garden center and pick up some pretty flowers for our hanging baskets and large flower pots on our back deck. They love picking out the colorful flowers and they REALLY love getting their hands dirty as we put in the plants in the containers. With these warm days we've been having, I was inspired to run out and pick up a few early season plants and get a jump start on this year's planting. Not only can I now look out my back window and see some pretty pansies and snapdragons, but it gave me the chance to try out the new Expand ‘n Gro™ Concentrated Planting Mix by Miracle-Gro®. It's that last feature that I think will be great for me. You see, sometimes I forget to water my plants as often as I should. When we were planting our flowers in the Expand 'n Gro mix, I could see how much water those natural coconut coir fibers absorbed and held. While I know I won't be able to neglect my plants completely, I'm comforted by the fact that mix will help hold onto the water that I do give them. That feature, coupled with the Miracle-Gro® plant food that's in the mix, is sure to bring the kids and I gardening success! See? Even our new kitten enjoyed the planting. Oh, and the snapdragons? Such fun for the kids! They're like pretty little flower puppets. I'm really looking forward to seeing this burst of Spring color now every time I look out my back door. Do you like gardening or planting with your kids? Leave me a comment (one per person, please) letting me know your favorite thing about gardening and how you would use Expand 'n Gro at your house. One lucky commenter will be chosen at random to receive a sample size bag of Miracle-Gro® Expand ‘n Gro™.